The Foundation’s Mesothelioma and Asbestos Related Support Australia (MARSupport) offers person to person (telephone and face to face) peer-based information, referral, advocacy and emotional support for those who have been diagnosed with mesothelioma asbestos cancer or another asbestos related disease, their carers, immediate family members and and to those bereaved. MARSupport operates across Australia and is available to New Zealanders via our Asbestos Disease Helpline and online news and information pages. When feasible, meeting with asbestos related disease sufferers, their carers and loved ones face to face. Where practicable, via face to face meetings, seminars, symposiums, etc. MARSupport is physically active throughout the Australian eastern seaboard and has a Memorandum of Understanding (MOU) with the like-minded Reflections Through Reality Foundation, which provides peer-based support and awareness in Western Australia. The MARSupport Asbestos Disease Helpline offers peer-based support and information from people who have, importantly, lived the mesothelioma asbestos cancer or other asbestos related diseases (ARD) journey. For Australian and New Zealanders who have been diagnosed with mesothelioma or another asbestos related disease, their carer and bereaved carers, our Asbestos Disease Helpline is open 24 hours a day, 7 days a week. For the general public (those not diagnosed or connected as above) the Asbestos Disease Helpline is open during the Foundation’s publicly accessible work hours (Monday – Friday 10.00am to 4.00pm). MARSupport Registration Form: As we are often on the road or not in the office when we talk with those we support, registering your details, either before or after you phone the Asbestos Disease Helpline is a great help to us. Please be assured your details are not passed onto any other individual or organisation without receiving your permission to do so on an individual needs basis (e.g. when making referrals, etc.). To register via the online registration form, please [click here]. We are active online via our social media based online news & information platforms. We do not charge, or place expectation of donations being made for any of our services (however, we gratefully accept donations from those who appreciate the support or services we offer), neither do we have (and never will have) any ‘pay by referral’ or ‘quota’ type relationship with any legal firms, medical specialists, individuals; corporate, union, or government bodies. We do however have relationships with, and recommend people and organisations we believe are specialists at what they do, are holistic and importantly, ethical! If you have been diagnosed with mesothelioma asbestos cancer or another asbestos related disease, or are the carer or immediate family member of a sufferer, we may be able to demystify certain aspects for you. Our experience shows people who have been, or are going through similar circumstances relate strongly with each other. When you contact the Bernie Banton Foundation about support or information, you will be dealing with someone who has walked the walk. No two journeys are exactly the same, but we have walked a similar path. Having walked this road makes all the difference in being able to help you answer the multitude of questions you may have, and navigate the journey ahead. Peer-based Support and guidance as you navigate the maze of medical and care pathways from diagnosis onward. Advocating – We advocate on the behalf of sufferers and their loved ones when dealing with the NSW Government’s icare Dust Diseases Care (and other applicable state and federal applicable jurisdictions), allied medical, health and care providers. Legal Help – If you have been diagnosed with mesothelioma cancer, or an asbestos related disease you may be eligible for compensation, a pension (or both) and/or other assistance – all states and territories differ. We can assist you in finding legal help from a specialist asbestos or occupational dust disease litigator, in all states and territories in Australia. If you, or a loved one have been diagnosed with MESOTHELIOMA CANCER or another ASBESTOS RELATED DISEASE and you would like to talk with someone who has been in similar circumstances, (whether you are a sufferer or carer), please go to the contact us page to find out the best time and way to contact us. Rod Smith, the Bernie Banton Foundation Support Co-ordinator, pictured with his late wife Julie Bastian. Julie was diagnosed with both pleural and peritoneal mesothelioma, and reproductive area (ovarian) mesothelioma in July 2008. 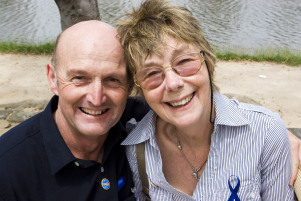 After enduring 4 operations and 20 sessions of chemotherapy Julie passed away at home just over 3 years later with Rod and Julie’s family by her side on 6 September 2011. Rod cared for Julie for the entire journey, including nursing her full time at home for the last 8 months of her life. Rod had nearly 30 years in the construction industry operating a mobile crane and transport company, is a past President and Support Co-ordinator of the Asbestos Diseases Society of Victoria, and is a board member representing support organisations, on the NSW Government ICARE Dust Diseases Board. In March 2018 Rod was appointed as a member of the inaugural Expert Advisory Group, advising the Australian Institute of Health and Welfare regarding the Australian Mesothelioma Registry. Apart from the unenviable life experience gained from living the mesothelioma journey with Julie, Rod now has nationally recognised qualifications in Community Services and also in Christian Ministry and Theology. Rod was instrumental in advocating for, and working with Council Council Victoria to produce and contribute to a world first booklet on mesothelioma entitled ‘Mesothelioma – A guide for people living with cancer, their family and friends’. It was released in September 2011 shortly after Julie died, Cancer Council Victoria honoured Julie by dedicating the booklet to Julie and fellow deceased mesothelioma sufferer (and friend) Farid Moghaddis. In 2013 the Cancer Council commissioned a Sydney asbestos disease research organisation to update the original 2011 Mesothelioma Guide. This was released in 2015 as a booklet only covering Pleural Mesothelioma, totally ignoring the needs of sufferers of Peritoneal Mesothelioma. Rod advocated Cancer Cancer Australia to rectify this and contributed to a nationally released Peritoneal Mesothelioma Fact Sheet released in 2016. After successfully advocating for a re-written booklet, covering both pleural and peritoneal mesothelioma to be released, Rod contributed to the revised (current) version, Understanding Mesothelioma published in May 2017. Karen Banton founder and CEO of the Bernie Banton Foundation is also the Foundation’s Grief Support worker. Karen is pictured here with with her late husband Bernie Banton AM. Bernie was diagnosed with asbestosis and asbestos related pleural disease in 1999 and then with peritoneal mesothelioma in August 2007. Bernie passed away at home, with Karen and family by his side, on the 27th November 2007. Karen supported and cared for Bernie throughout their nearly 9 year journey with asbestos related diseases, and with Bernie being the very public face battling James Hardie Industries in the fight for compensation for victims. All these years later Karen is still there doing what she does best, being a very much hands on CEO, supporting people and being the public face of the Bernie Banton Foundation. Karen has added to her undeniable life qualifications gained through living the asbestos related diseases journey with Bernie, and the many years since with the Bernie Banton Foundation, by attaining nationally recognised qualifications in Community Services and a Diploma in Christian Ministry and Theology. The Foundation relies on donations, and sponsorship from corporate friends; and donations, bequests and fundraising from the wider community to survive. We are a registered not for profit charitable organisation – therefore any donation $2.00 and over is tax deductible. Any donation, sponsorship or fundraising endeavour you, or a company, union or government body you are involved in can make to help the Foundation, is really greatly appreciated, and will assist the Foundation to continue to fulfill Bernie Banton AM beliefs. Please take advantage of what the Foundation offers – it is why we do what we do!